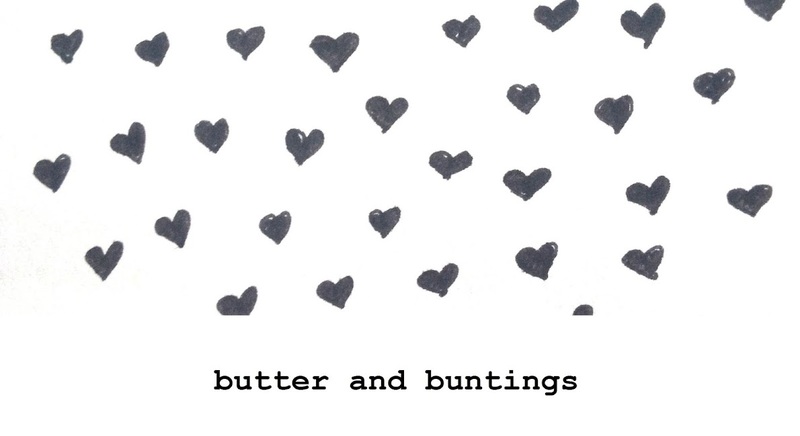 Butter and Buntings: Tea For Two and Two For Tea. Sorry for my silence lately..I thought I had seen the end of my blogging days as my computer hates me (and I hate it), but i've won and i'm back now! So, best I get on with it! Here are two 'tea' recipes I thought I would share with you. Both are good with a cup of tea. Apple and Cinnamon Tea Cakes. 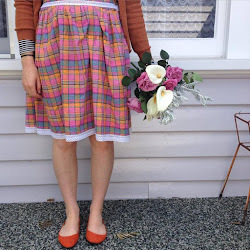 I made these recently for morning tea at a crafteroon I went to with my sis in law. Seeing as we nearly ate the whole batch(I may have finished them on the way home), I think they were a hit! 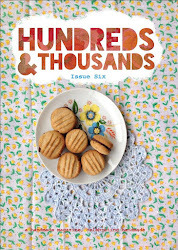 I got the basic recipe from this fab book, then changed it slightly. Preheat oven to 180C. Cream the butter and sugar until fluffy. Add the egg and mix well. Combine the flour, baking powder and salt in a bowl. Add the milk and flour mixture alternately into the egg mixture. Combine well. Pour into pretty patty pans. Place a slice or two of the apple ontop and bake for 15 minutes or until skewer comes out clean. While the muffins are still hot, brush with hot butter and sprinkle cinnamon and sugar ontop. Banana and Apricot Tea Bread. I love a good tea bread. 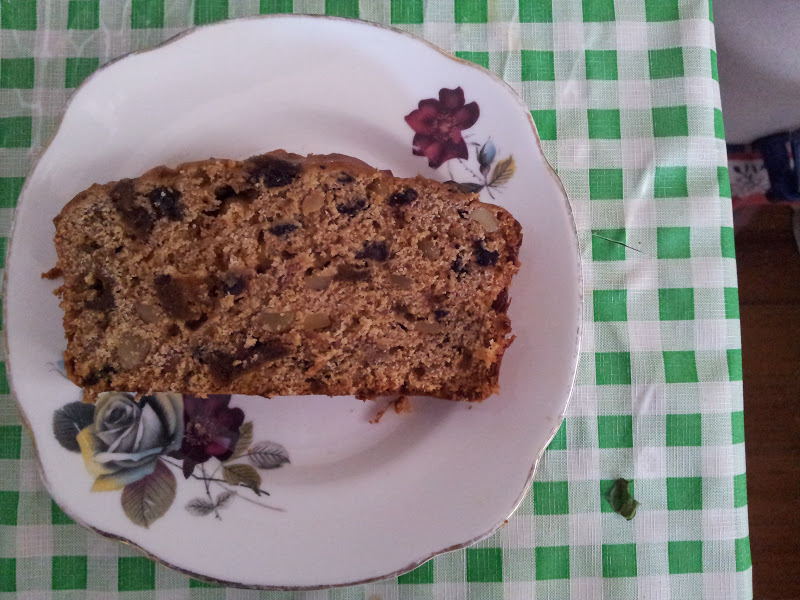 My mum makes the best tea bread! If your reading mum...a few of yours as Christmas pressies will make me very happy! This tea bread I made was really yummy. You could have it for brekky or with a cup of tea in the afternoon. I love that you can see all the yumminess..the fruit and the nuts. Smear a good amount of butter on your slice and it really is one of the best foods! I got the basic recipe from here, and the lovely photo idea(we've got matching plates), but changed it to suit what we had in our pantry and added an extra something. Preheat oven to 180C and grease and line a loaf tin. Soak the currants and apricots in the water with the tea bag for 15 minutes. Adding the tea bag is something my mum does. It adds a subtle tea flavour and the fruit gets even tastier. Combine the butter,baking powder, salt, sugar and egg in a bowl until well combined. Add the flour gradually until well combined. Add the mashed bananas, fruit and nuts and fold in well. Pour into your prepared tin. Bake for 45-50 minutes or until a skewer comes out clean and it looks golden.Sit in tin for 10 minutes then cool on wire rack. Slice and enjoy! This keeps well in a airtight container. Don't forget the butter! Hope you have enjoyed these recipes!